With 9 foot ceilings on both the first and second floor this Dillon II floor plan is sure to impress. A sunroom and stacked sliding door allow the gorgeous great room to open up to a covered patio. Ideal for entertaining with a gourmet kitchen, dining room, butler's pantry, study and loft area. The home offers charming touches such as a coffered ceiling in the master, sink at the butler's pantry, built in bookcase and french doors in the study and a tiled fireplace in the great room. Practical additions to the home include a utility room package in the laundry room, gas rough ins for the range and barbecue and a 3-car garage. This home can be found in the Anthology West neighborhood in Parker which provides a pool, rec center, large park and access to walking trails. There is still time to select finishes at the Richmond American Home Gallery! 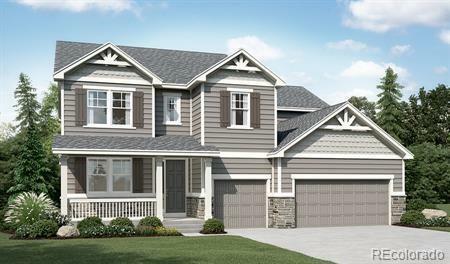 This home is under construction and will be available in January 2019.